I mostly used #s 5 and 6. …Yes, Nysha has walled a bishie! So I had two main goals before this project: I wanted to wall a bishie (way too many girls in my gallery), and I wanted to wall bamboo (because I love bamboo!). 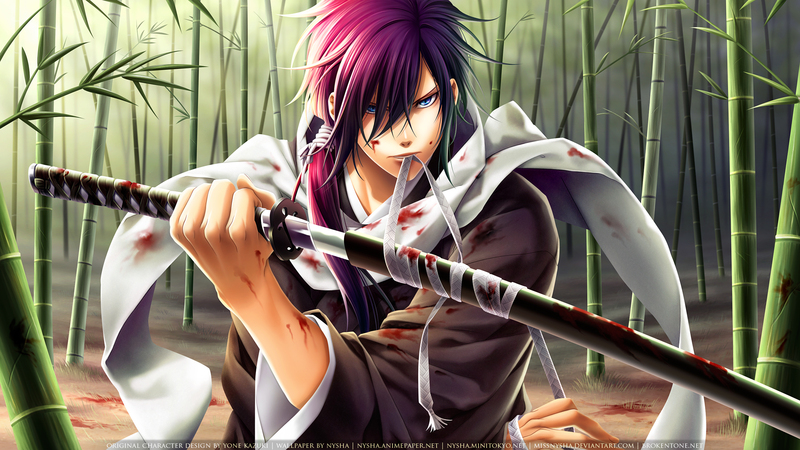 And I didn’t want to wall just any bishie – I prefer the more serious and badass ones lol. The basic idea of the wall’s scene is that Saito is getting ready to defend/fight against an antagonist in the middle of a bamboo forest. Expect a super showdown with bamboos hacked over and everything. The extra blood is for those certain fangirls who like that. >D A “clean” version without any blood is also available. Everything was painted via vector masks like how I usually do. And 100% Photoshop with my Wacom Intuos 3 tablet. The background was made from scratch, while I used some various bamboo reference photos I took during my Japan trip to get the basic perspective. Some details of the original scan were either incorrect (the directions of the string’s braid) or too dark to make out (the sword’s handle), and I had to reference some tsuka-maki images http://www.montanairon.com/tsukaimages.html to see how the handle is wrapped. Check out the progress pic! Time taken: in 16 sittings, about 4-6 hours each time, over the course of about 2 months (I was busy with other RL stuff), so roughly 80 hours total, more or less. Nysha's amazing use of gradients are the win in her newest piece. The soft, nature scheme that is so rich in color highlights the delicate work she's placed on her main character. The painting is firm yet so neat, bringing Saito to life. She even took care of correcting those small details that most wallers would ignore, such as the sword handle. The background, which was crafted from a combination of photos looks flawless. Nysha really shows off her level of care for perfection in this piece, well worth a highlight. Proposed by Kitaan and highlighted by Fran. WOW! It's marvelous!I know you've been working very careful and long on it! Details, composition, colors -all carefully planned and makes harmonical and charming look! And even it seems that the fight begins(his eyes, pose - you truly showed them and filled with your special style) - wallie 'alives'. This wallie is a masterpiece - what else I can say? not much too say except for great job! not much to say in here besides +fav! As I said on AP, this wall is awasome and amazing. That's a piece of art for me, just perfect! The BG is fantastic and Saitoooo! I'm really impressed! Thanks for sharing! Everything is perfect, I love the colouring it's so vivid and beautiful. Zomgoodness! I too don't really like the anime but you really done the original art justice! It's amazing! It's just perfect! And this really is your first bishie! :O Not that it matters, I mean if you were to wall a stone I would worship it, you're just that good and you always give it your best. I give this wall 100 out of 100 zomg kittehs! I'm not so fond of into vectors stuffs but I have to admit that this wall is seriously kickass ! The amount and quality of details are really mindblowing ! Truely a fantastic masterpiece ! The scale and detail of this work literally takes my breath away! Words can't cover the beauty and levels of work involved here. Simply, this is amazing! Awesome job you done here! *_* oh my this is just amazing. despite of it being a saito wall. everything is just fantastic. Im so happy to finally see it finished. Its just amazing, on the vector the attention to detail on Saito is so eye catching. Not only did you do Yone Kazuki artwork justice but adding your extra touch makes it look even better. I like the extra touch of the blood putting him in fight mode XD On the background its a good structured bamboo forest and use of detail work as well. Brilliant job on and hope to see more bishie walls from yourself! WOW! This is really OMG! you know how much I've been waiting for this wallpaper. Finally XD Poor Saito trapped in your PS for months! Hope you fed him well :D Wonderful painting, and I like the touches of blood. The gif you made is way cool! Keep up the great work!